It’s easy enough to forget, but wine is fun. We fall into habits of overthinking, over trying, over concerning ourselves with large doses of details ( I do, at least), when sometimes the most intelligent thing to do is go with the flow. Life is difficult enough, let’s sneak in an easygoing ‘tude when we can. Take the edge off. Wine should definitely serve this purpose. I go on and on about bubbles. If you can’t tell, I love them. Anytime. Especially on days when I don’t really have to be concerned with…responsibility. 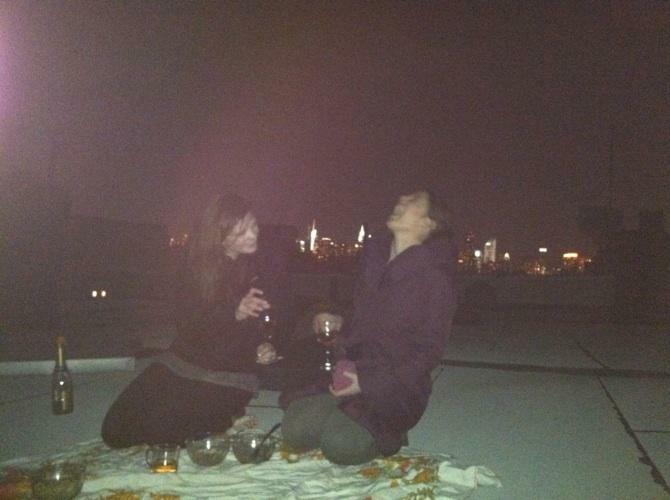 Last weekend I enjoyed a rooftop dinner (thank you global warming and my first class Greenpoint, Bklyn view) with sweet friends and delicious sparkling wines. A Cava called Ca N’Estrella from Rabetllat I Vidal, some sparkling Limoux, and later on, a bottle of Jean Bourdy’s Crémant du Jura (beautiful and bright!) snuck into Angelika Film Center. Poured into plastic Yankee cups, paired with movie popcorn, just the right amount of butter (lots), and My Week With Marilyn– Marilyn would have been proud. It couldn’t have been a lovelier evening and wine was just along for the ride, a no-brainer. Wine, duh. With the weekend here again, it’s good to remember that sometimes there is little more reason than that to drink it. Delicious, awesome, fun. See? Fun!